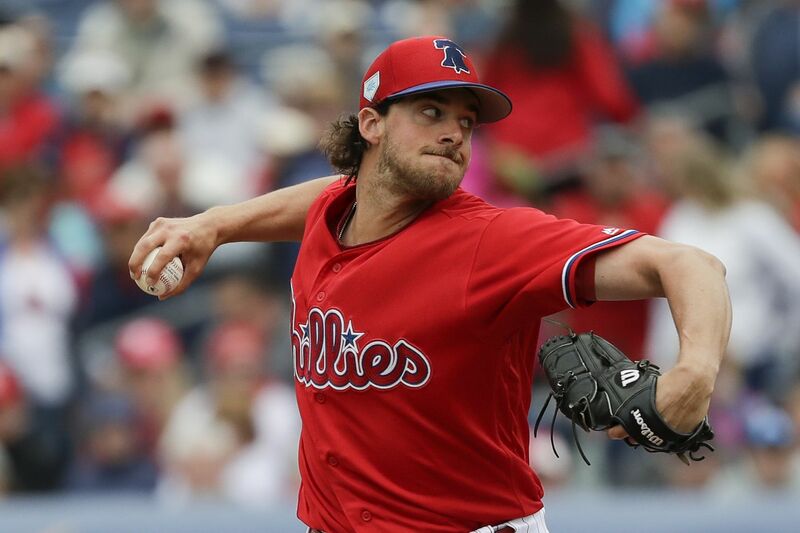 Aaron Nola will take the mound for the Phillies on March 28 at Citizens Bank Park. LAKE BUENA VISTA, Fla. -- It might have been the easiest decision Gabe Kapler had to make this spring. The manager announced Friday evening the identity of the starting pitcher for the Phillies later this month in the season’s first game. Nola entered spring training as the team’s obvious No. 1 starter and the announcement that he will start against the Atlanta Braves on March 28 at Citizens Bank Park was a mere formality. And these announcements could become a spring-training tradition as Nola signed an extension last month that could keep him with the Phillies through 2023. The Phillies could have an easy decision to make each year. His 2.37 ERA last season ranked second in the National League, and he led all major-league starters in WAR with a 10.5 mark. His opponent batting average (.197) was the second-best single-season mark ever by a Phillies pitcher. Bryce Harper will make his spring-training debut on Saturday in front of a sellout crowd at Spectrum Field. Harper will be the Phillies’ designated hitter against Toronto and take one or two at-bats, Kapler said. Harper is expected to play in right field on Monday at home against Tampa Bay. The Phillies introduced Harper last Saturday at a news conference on top of the first-base dugout. He spent the next week taking batting practice and playing in simulated games as he worked his way toward playing in a Grapefruit League game. Harper said he would like to have 40 or 45 at-bats before the start of the regular season. The Phillies will have the chance to get him close to that mark before leaving Florida. Jake Arrieta will start for the Phillies on Saturday against Toronto. ... Odubel Herrera no longer has the flu and will begin a running program on Saturday as he deals with a hamstring strain. Cesar Hernandez (hip flexor) took live batting-practice against minor-league pitching on Friday and Roman Quinn (oblique) felt good after running. “My expectation is that both of those guys have a good opportunity to be fully ready to go on opening day," Kapler said of Hernandez and Herrera. “I don’t think it’s out of the realm of possibility that Quinn surprises us. I want to keep that open.”... Zach Eflin pitched 2 2/3 scoreless innings in his second start of spring training as the Phillies lost, 5-4, to the Braves at Disney’s Wide World of Sports complex. He struck out three, walked two, and allowed one hit. Andrew Knapp homered and Aaron Altherr went 3-for-3 with a double.